2 Holiday vouchers worth £2,500 + £1,000 cash! Jingle bets, jingle bets, jingle all the waaaaaay! Get your hands on a cool Xmas gift with the Christmas Sports Giveaways! BetVictor’s Santa Claus is looking to reward you earlier this year, so go ahead and Opt-In to the Christmas Sports Giveaways and earn yourself a cool 55’ TV and loads of other prizes! Just simply place a wager of £25 on any Sporting Event or even Virtual Sports market to earn yourself an entry to the Prize Draw that can see you win an LG TV 55’ that’s worth £800! Don’t worry if you come in second, because BetVictor has enough for everyone, but in case you really want to be number 1 on the leaderboard to claim the top prize, then we suggest you Opt-In more often and place more bets. The more you wager the higher your chances are of clinching the best gifts under the Christmas tree this year. Besides the TV, Christmas Sports Giveaways also gives out an iPad Mini 2 (£275), Amazon vouchers (3x – £100 each), 12 Month Racing UK Subscriptions (3x – £298 each), 12 Months FourFourTwo Subscriptions (3x – £40 each), Marks & Spencer Turkey (5x – £30 each) and Christmas Jumper (5x – £20 each). The winners will be picked at random, which means that you can win any one of these awesome Christmas Sports Giveaways! But keep in mind, the more you wager on sports during December the more likely you are of winning the best prizes. Make sure to hurry up with your betting; this is a limited time offer so you only have a brief moment of time before the window of opportunity closes on 23:59 (GMT), December 11. But wait! There’s much, much more you can win this festive season! 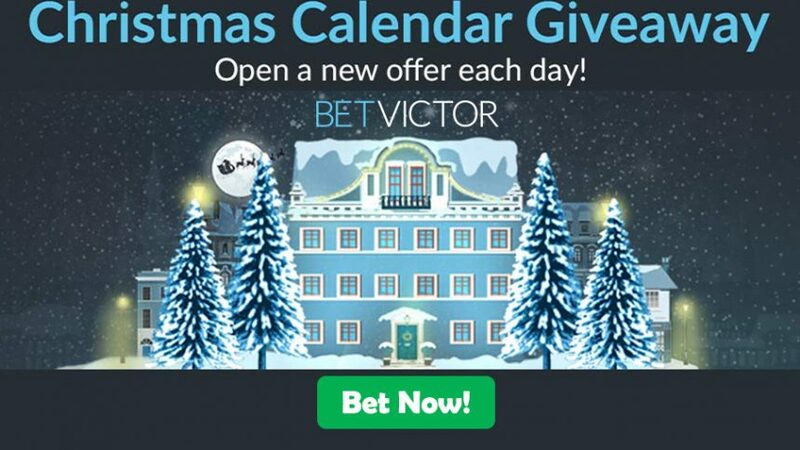 BetVictor’s Christmas Calendar Giveaway Holiday Prize Package dishes out one of two whopping prizes that includes £2,500 Holiday Voucher + £1,000 Cash! But if you’re not interested in big prize giveaways, we understand. Just turn around now and enjoy your special Christmas cookies by your grandma and pour yourself some more tea. These sort of gifts may lead to too much excitement and you may not know what to do with all that CASH! But in case you choose to make the right decision and Opt-In for this offer, then do it before December 22 to collect the Holiday Prize Package! Christmas Sports Giveaways offers you the chance to have the best of both worlds: online sportsbook prizes and online casino offers during the December festivities. Betting over the holiday season has never been this fun, so make sure to use your time wisely to scoop all the biggest prizes with BetVictor’s Christmas Sports Giveaways! Opt-In on a daily basis to see yourself earn an entry to the Prize Draw that can also see you unwrap other gifts for BetVictor Casino. Claim prizes daily with Christmas Sports Giveaways!